When an asset is updated in an instance of Elvis in which Enterprise is integrated, the change is immediately synchronized with its related shadow object in Enterprise. 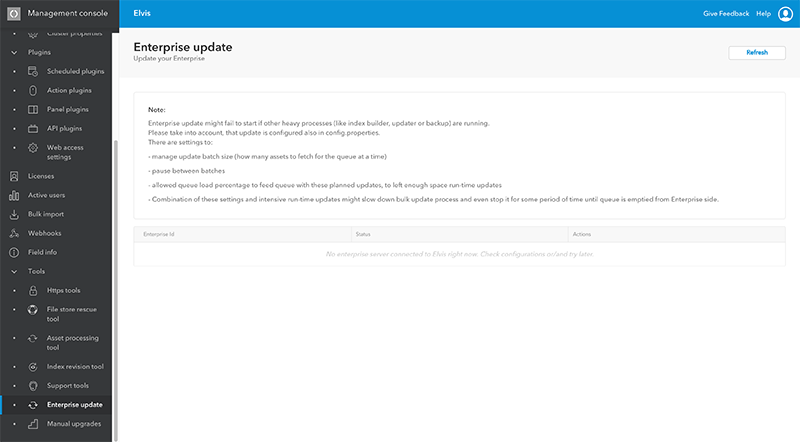 However, should this process be interrupt or not working at all, the synchronization can be initiated manually by using the Enterprise Update page in Elvis Server. For Elvis 6.16 or higher: access the Management Console and in the menu on the left, choose Tools > Enterprise update. For Elvis 6.15 or lower: access the Admin pages and choose 'Enterprise update' in the menu bar. There are a few settings to tune the update process, these can be configured in the config.properties file (requires a server restart).